My home has been crowded lately. Its been me and my mom for a while, and this summer my brother joined us. I didn’t think about it when he first moved in, but i haven’t shared a house with the two of them since 2005. And I haven’t shared the same room with my brother since I was 7 years old. Now, I love my family, but this living situation is tough for me – especially since just last year I was living in my own nice apartment, organized exactly how I wanted. Given this state of affairs, my creative energies at Techshop have largely gone towards improving my living space – to make it more livable for 3 people living close together. But I have a problem, I have trouble managing myself. All the other jobs I’ve had involved working for others, on their schedules. Now that I’m trying to work for myself, on my own schedule – I have to learn a whole new skill set. One thing I know for sure is that to be productive, I MUST get out of the house. No matter what I do, when I try to work or be creative at home, I just end up wasting time. I first learned this lesson back in high school – the beginning of junior year, my grades had been getting worse and worse. Not because I didn’t understand my classes, but because I wasn’t doing the homework. Sometimes I just didn’t do the work at all, and then when I did do it, I was usually late. But then I got a girlfriend of sorts (it was complicated). She went to the library after school to do her work, and since I wanted to be around her, I followed. Just 1-2 hours at the library with her – even subtracting time for flirting and goofing around – was worth more than an entire evening at home. Even after we went our separate ways, I continued doing my work outside the house, and my grades kept getting better – because I was actually doing my work on time. It’s a hard lesson to accept, because when I’m at home – my bed is just so comfortable, my cat is just so warm sitting on my lap, and snacks are just so close at hand…I wish I could get work done there, but I can’t. So this week I’ve made sure to get out of the house everyday, as early as I can – even on days when I don’t have any actual projects to work on. Yesterday the whole wood-shop was reserved for a class, so I couldn’t get any work done. But I just sat in the Techshop lounge and sketched up ideas for my next projects. It was time well spent – I made 5 sketches in the same time I would have finished 1-2 working at home. I’ll post some of my sketches soon. As I said in my last post, I’m starting to get serious about my making. Part of that is exploring how I can make money off my work. I’ve already started to make a little bit – I’m teaching a monthly workshop at Techshop based on my cutting boards, I’m working on a couple of projects commissioned by friends, and I did one big job for a local contractor that needed help cutting some custom mounts for a floating staircase. But now I’m interested in taking my woodworking-for-profit to the next level. I’d like to sell some of my own designs. 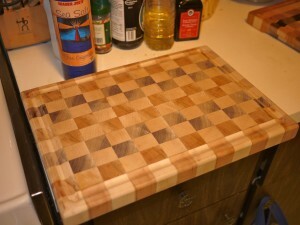 I’m going to start by focusing on the product I’ve already perfected, cutting boards. I have some ideas for really innovative designs that I haven’t seen anywhere else. I’m also experimenting at Techshop with other kitchen and household improvements that could form the basis for future products. Towards that end, I went to the library on Tuesday and started planning out how I could start up my own woodworking business. The San Francisco main library has a great section devoted entirely to small business issues. I browsed through the stacks and found three books that seemed like perfect foundations for my research. It was tough, but rewarding – I feel like I’m working out mental muscles that haven’t been flexed since I graduated. The three books are NOLO’s “The Small Business Start-up Kit for California” and “How to Write a Business Plan,” along with “Grow Your Handmade Business by Kari Chapin. All these books are well thought out, methodical and informative. They offer lots of nuts-and-bolts advice about how to analyze a startup business, before spending a dime, and how to turn an interest or hobby into a business. On the one hand, I feel a sense of confidence, writing out my goals and researching their viability makes my dreams feel more real and achievable. But on the other hand I feel intimidated – putting down all my hopes, dreams and assumptions makes me feel naked, especially since I plan to enlist help from many others before I get started. I traditionally do things on my own, and sharing so much with other people will be terrifying. But that’s a good thing. One of the goals for my Passion Project is to continually live outside my comfort zone. Over the next few years, I want to always be just a little bit scared. Right now I’m scared on two fronts – first of all, what if I fail? What if I go through all this planning, preparation and hard work, and don’t have anything to show at the end? Second of all, I’m coming to the end of my savings from working in Korea – I have to make a go of this woodworking business now, or take a break and save up some more money later. But I can overcome both of those fears. Even if my plans don’t work out, and I fall flat on my face, I will have benefited by trying. That’s the reason I’m trying to be as systematic as possible – in addition to setting up my business, I’m getting the experience of setting up a business. I may or may not succeed in the end, but the skills I learn will stay with me for a long time to come. Also, I’m sure by the end of this process I’ll have a much better idea if this is the type of work I’m cut out for. I’m not going to share my step by step business planning on here – I need to feel the freedom to write whatever I want without worrying about others reading it. But I will share commentary on my experiences, and once I’ve finished the process I’ll share much more about my plans. For now, I’m going to take things slowly. I’m working through 1-2 chapters in these books per day. Yesterday I went through a self-assessment to determine if I really want to start my own business (I do.) 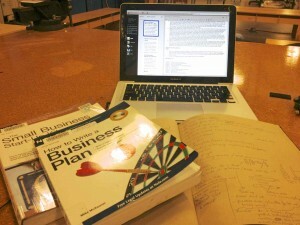 Today I started the process of writing an actual preliminary business plan. I’m going to take the rest of the week to write and refine my business plan, and then I am going to reach out to others. I’m going to make time to talk with people in my family who started their own businesses, then try to find some online and local resources with information on woodworking businesses in particular. When I was a kid, the tooth fairy didn’t bring me cash – she brought me craft supplies. I remember waking up with crayons, pipe-cleaners, puffy paint, T-shirt art kits, stickers, and small lego kits under my pillow. The same thing went for Christmas, birthdays, and any other gift-giving event. Throughout my childhood I had a big toolbox of craft supplies, and a bigger box of Legos, Knex, and Erector Sets – both of which I spent hours with, not only creating, but carefully organizing. In junior high and high school I started making tie-dye T-shirts, and until the end of my college career I made and wore shirts of my own design. And later in high school I started to get into electronics – I got a prototyping kit and a bunch of surplus electronic components off eBay. Starting with simple circuits, I played around with LEDs and a variety of sensors, eventually making a line-following robot. I even had a short lived eBay business refurbishing broken Nintendo machines for resale. Then I got into college, and my creative side started to die. At least, that’s what it feels like sometimes. Don’t get me wrong, I have done a lot of interesting and fun things since then. If I had made different choices, I may never have had the opportunity to live, study and work abroad in Asia – something I never would have imagined except for a chance encounter at El Camino College. But this whole time I’ve had nowhere to put my creative, inventive energy. What’s even stranger to me is how easily the spark died. There is no single event I can cite – in high school I talked of pursuing science related careers – maybe some type of physical or genetic engineering, maybe some artistic track – visual arts, culinary arts, or design. In high school I joined two clubs – ceramics club and science club. I also voluntarily took photography and art, spending not just class time but significant time after school painting and learning to use my dad’s old manual camera. But then in college, I dropped all my creative classes and just focused on the required courses, I suppose in preparation for transferring to a university as quickly as possible. But in my entire time at college and university I only took one physical science class (astronomy), despite science being my long-time favorite subject. And I took no art classes (except for the cultural classes I took in Korea). Of course it’s natural to outgrow one’s youthful ideas and hobbies – but I wish I could think of the moment I rejected these interests. After college I eventually rediscovered my impulses, and I felt a certain horror and regret that I had never considered science, manual labor or art as realistic career paths. They were just hobbies, apparently to be pushed aside when more ‘serious’ academic work presented itself. I first began to change my way of thinking when I started volunteering after graduation. I worked with Habitat for Humanity building low income housing, and GRID alternatives installing solar panels, and I got my first taste of physical work. And I loved it. Working outside, staying active one whole day, even doing something as simple as shoveling dirt around, was more rewarding than the weeks of office work I had done for my internship. And even weeks after a project, I could look at the houses I helped build – I could remember installing insulation and siding in the houses on Whitney Young circle in San Francisco, and digging backyard gardens near the Daly City Bart, and mounting the solar panels (which are still there) on the roofs of houses in the Bayview and East Bay. Every time I rode by ‘my’ houses on the bus or BART, I had a tangible reminder of my work – and that felt good. It reminded me of when I was a kid – and my dad, who works in architecture and construction, would point out every house with a foundation he had poured, and every gas station he helped install, or building where he remembered climbing scaffolding to put up siding and paint. I realized that if I had an actual job doing these things, I could get that feeling all the time. I still value the city planning, urban design, statistics and government that I studied at university – but I do regret not exploring more options. It was clear early on that my heart was never in it. As most of my classmates made plans for their future studies and careers, going deeper into the field, I didn’t know what I wanted to do – but I knew it wasn’t urban planning or policy. But inspired by my volunteer experience, I signed up for some vocational classes at SF City College. I get certified in solar installation, took a class in electrical wiring and basic construction techniques, and signed up for a pre-engineering program where I got back into my electronics hobby – building increasingly complex circuits and little robots. Then I once again I got side tracked, going off to explore another potential passion by teaching in Korea. I don’t for a minute regret that trip – I learned a lot about myself, grew in many ways, and hope to return someday. But this time I didn’t quite lose my creative impulse, and when I returned from Korea, Techshop was waiting for me. This brings me to today. The past year has been a long, bumpy, road for me. I first joined Techshop a year ago, but I haven’t gotten to do all the work I hoped to do. In part this is due to the complex recent events in my life. But it’s also just been a really steep learning curve. 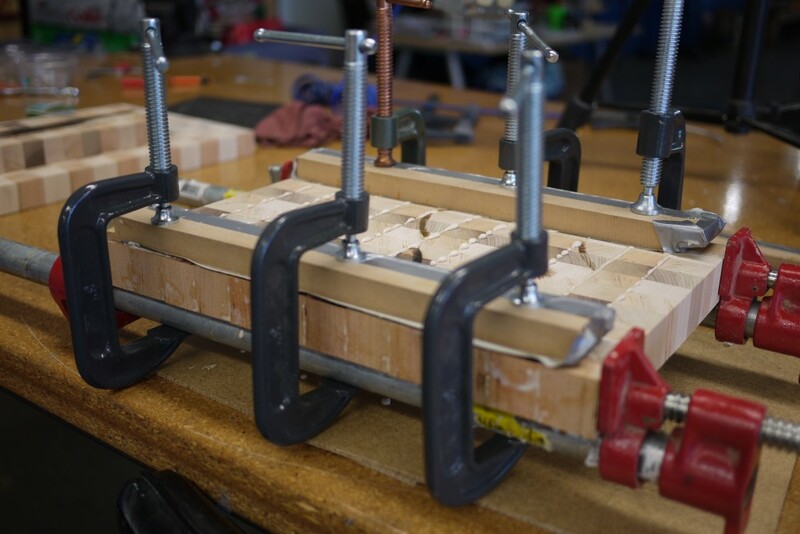 When I started Techshop I didn’t even know how to use a saw or hold a welding torch – but I had dreams of creating fine furniture, my own bicycle frame and full-blown electronic projects. At time it’s been frustrating, but step-by-step I’ve learned to take it slow, experiment a lot, and ask for help. And so I’ve made progress. Simple projects like my cutting boards have given me a LOT more confidence in working with power tools and hand tools, and I now think I’m ready to start getting more serious, and more creative. That’s why I want to make my time at Techshop the second leg of my Passion Project, a series of jobs and life experiences aimed at discovering my personal goals, skills and place in this world. My first passion project was Teaching, which I completed by teaching in Korea and Thailand. I will call this passion project “Making,” because over the next few months to a year I hope to immerse myself in all aspects of making things. I want to work with a variety of materials, and let my creative side fully flourish. I want to change my time at Techshop from a hobby into a lifestyle, I want to try and support myself with my work. I want to continue teaching workshops, start teaching classes, and eventually try offering creative products and services. Starting next month, November, I will have a chance to put all these goals into practice, with more chances to teach, and my first opportunity to sell my work. I’ll keep writing about my progress right here. 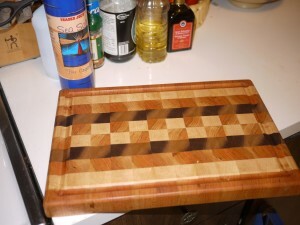 Remember those cutting boards I wrote about earlier? 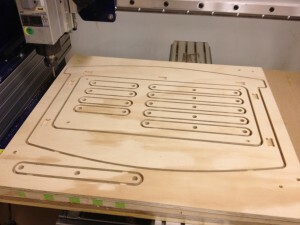 Well, I’ve now started teaching workshops on how to make them at Techshop. So far I’ve just taught two – one in September and one in October. They both went really well and filled up quickly, so I’l be sure to teach more soon – especially with gift-giving season coming up, everyone wants to make presents for people. I was incredibly nervous before my first class. Not only because it was my first class in over a year, but because I’ve never taught this kind of thing before. It’s a lot different teaching a hands-on skill like making a cutting board than it is teaching English. I went in two days before and did a walk through, making a cutting board myself and pretending I had students around me. Then the night before the class I spent hours adapting my Instructable into a handout for the students. Even after I made the handout I read it, and re-read it, and re-read it again, and finally had my mom read it over. By the time I actually started class, all my old confidence teaching had returned, and I had a really good time. The students were nice, receptive and appreciative, and they had lots of good questions to ask which gave me ideas for some experiments to try in my own future work. Plus, I got paid for it! Bonus! And that’s not all – afterward the education director told me they are looking for more teachers for other classes – not only at the San Francisco Techshop, but also in Menlo Park and San Jose. It’s a freelance gig, so it’s not a steady job – but that’s perfect for me, exactly the type of work I’m looking for at the moment. I think I could easily teach any of the woodshop classes, except for the wood lathe and advanced jointery classes. She said all I have to do is sit in and observe another instructor teaching the class, then teach one class supervised, and then I can teach the class anytime in the future. I can also work with one of their staff members to develop my cutting board workshop, along with other workshops I think up, into full-fledged classes that anyone can teach. The downside is that I would lose my exclusive instructor status for that class, but the upside is that I get paid for the time spent developing it into a full class, and they will be able to teach it even if I move, or go abroad to teach again. This opportunity came at a perfect time. Just teaching one workshop a month pays for most of my Techshop membership – and one more class per month would start making me a profit. In addition, I have another great opportunity coming up this month, which I’ll talk about later. I haven’t been able to keep up this blog like I intended, and that’s because over the past few months my life has been turned upside-down and shaken all around. I’m just starting to get back into my normal groove again. I can’t go into too much detail, because it involves other people’s private information, but there are some people very close to me who have been going through some very tough times lately. From July until last month, most of my time and emotional energy has been going into helping them get back on their feet. The good news is that it was time well spent – step by step they are putting their lives back together. And as they build themselves up again, I can start to remove myself and get back to living my own life. For my family and close friends reading this, you probably already know the situation I’m talking about. If not, talk to me privately and I can discuss it further. The point is, though, that I’m not back at Techshop, and I’m starting to get serious about my work there. I will talk about that further in my next post. I ran across an article on the Atlantic, which claimed new research showed that density of cities had little to no effect on sustainability. The article was based on computer modeling future development of three regions in the UK, and concluded that building these areas more densely would not significantly affect people’s behavior – only reducing the amount of vehicle traffic by ~5% as compared to diffuse, market-driven suburban development. Of course this flies in the face of prevailing thought, but it struck me as problematic for deeper reasons. My biggest problem with the models presented in the paper is that they analyze density as an <b>isolated</b> goal. This makes sense scientifically – it’s easier to measure one variable at a time instead of considering multiple, interacting variables – but it’s just not how the real world works. In the real world multiple, complementary, policy goals must be pursued at once in order to be effective. I think of compact development not as a single policy, but as a pre-cursor to other policy goals. So the paper treats “compact development” and “shifting from the automobile to public transport” as two separate variables. But anyone who has visited New York and Los Angeles (sorry, I’ve never been to UK and can’t comment on the areas studied) knows that improved public transit and compact development go hand in hand. It is very difficult to develop successful public transit in Los Angeles, because the density just doesn’t support it. But the more dense a city becomes (like New York) the more impact a single new train or bus line can have. Therefore density is not a goal unit itself, it is a way to enable practical use of public transit. I’m sure this is true – but again, only if density is analyzed as an isolated policy. Expecting people to drive cars in a more compact city WILL lead to more congestion – and creating penalties such as fuel taxes, road pricing or reduced parking will only make people’s lives harder – and NOT change their behavior. But yet again, this is an unrealistic idea. In the real world we can develop these two goals together – improve public transportation at the same time as we encourage compact development. Why stop at 2 policy goals? As commentator Chris_Mackenzie said earlier, what about mixed use development? What about innovative programs such as car-sharing that let people have access to a car without owning one, which makes it easier to live a transit based lifestyle with the convenience of a car when needed. In my opinion, this paper is only valid within a very small conceptual box. It proves that increased density alone does not impact sustainability, but no sane planner would pursue density as a goal by itself. Density is a not an end in itself – it is the means to an end, which makes other urban development possible. 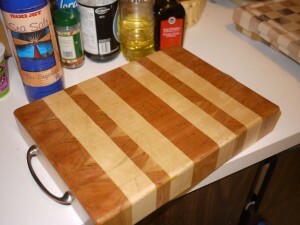 This week I wrote up an “instructable” on how to make my cutting boards. An instructable is a how-to article on “instructables.com”. It was a great way for me to gather all the information and research I did on making cutting boards in one place, as well as share it with others. Also, Techshop has a program where they will give free classes in return for Techshop projects posted on instructables. Next week I’ll be taking a short break from my Techshop work to visit my family on the east coast – Washington D.C. to be exact. I haven’t been updating much, but I haven’t been idle. These are some of the things I’ve been making at Techshop recently. The first two have been oiled, the last one still needs to be finished. They are made out of maple, cherry and walnut. 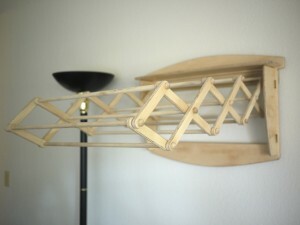 These are a simple woodworking project that turned out really nicely. I learned quite a lot about basic wood-shop tools. These first three were simple checker designs, next I’m going to try and make some more elaborate designs and see if I can sell any. These are two lamps I am working on, they were actually the first things I made on the CNC machine. They are both made of cherry, and the skin is hemp fiber paper. The skinny one was copied from another lamp, while I designed the round one myself on the computer using Autodesk Inventor. I need to change the design to fix a few small problems, but I think it’s a good prototype. 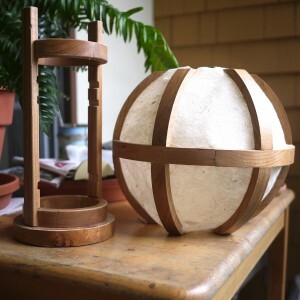 Below is a video of the lamps being made. This is a clothes drying rack which can be mounted on the wall and extended out or folded up. 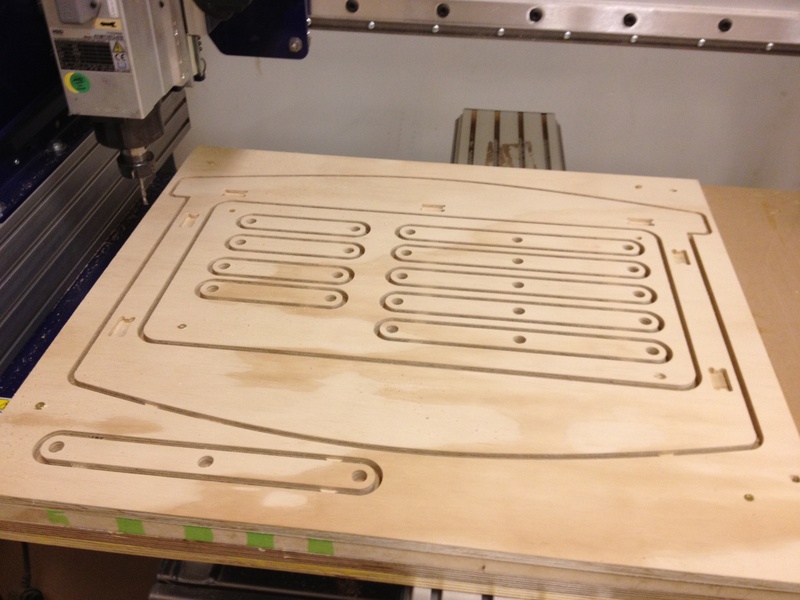 All the parts were cut on the ShopBot CNC machine (computer controlled cutter). This was my first profitable project, some white oak stairs treads I worked on for a contractor I met at Techshop. He had the lumber, but needed the underside cut perfectly to mount on metal supports. The above picture is from the finished house where they are installed (credit: Teed Haze – developer). Below is me making the stairs. In addition to my work at the Bike Kitchen, I have been fostering my creative side at another workshop called Techshop. Techshop is a chain of community workshops, with locations in San Francisco, Menlo Park, and San Jose in California and Raliegh-Durham, North Carolina and Detroit, Michigan. Each shop has every kind of tool a builder could want. They have a wood-shop, metal-shop, sewing-shop, electronics-shop, and plastic-fabrication-shop. They have computer labs loaded with expensive design software, 3D printing machines, robotic cutting machines, laser printers and more. Being a creative type, the possibilities were almost overwhelming the moment I walked in the door. I first heard about this concept years ago, from MIT’s chain of Fab Labs built around the same premise. Their location in San Jose has been around for years, but when I arrived home from Thailand I was overjoyed to find they had opened a location in San Francisco proper. The first thing I did was take a whole bunch of classes. I started with the metal shop, then moved onto TIG welding and MIG welding, wood-shop, laser cutting/engraving and CNC (computer numeric controlled) machining (aka – programmable robots cutting stuff). My one mistake was signing up for a membership before I had any plans about what to build. I wasted a couple months just mucking around on the machines without any particular goal in mind. But I’ve now become systematic about my crafting. I have a notebook full of sketches and ideas, and try to think up new ideas each week even as I’m working in the shop. I absolutely love this shop, and lately my whole life has been revolving around going there. It’s almost like a dream come true. If I was to win the lottery, one of the first things I would probably do is build a workshop EXACTLY LIKE THIS. A place where I could go try and make any hair-brained idea into reality. But sometimes Techshop can be much better than a personal workshop – there are lots of creative people under one roof who are happy to bounce ideas off each-other. The only negative thing is having to share all the tools. They are clearly expanding and going through growing pains. Most of the machines are used 24 hours a day, which means they regularly break down and require maintenance. Also, while most people respect the machines, some people ignore the rules, mistreat the equipment and mess up the settings on machines. But these drawbacks are more than overcome by having access to hundreds of thousands of dollars worth of equipment, and having a big open space to do messy work while still living in a small apartment. 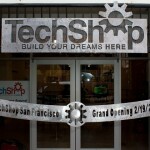 I will have a lot of posts about Techshop coming up.